The holidays are upon us. There are decorations in the stores, holiday music on the radio and ads popping up around every corner telling you what you need in order to have a memorable holiday. So many commercial gems this time of year! The further I get down the rabbit hole of financial independence and frugality, the further away I get from materialism and consumer goods. And if there is ever a time to become even more aware of this gap, it is during the holiday season. Over the past few years, Mr. Wow and I have been making small, but significant changes to how we do Christmas and have been slowly integrating the changes into our immediate families as well. To be honest, it has taken some time, especially to change some of the deeply engrained gift-giving mindsets of some, but I think this year our effort has paid off. Since I gather that most people reading this post are relentlessly trying to life-hack the holidays in effort to not derail their FI goals, I wanted to share with you what we do. Although we ultimately want to get away from this mentality altogether, some family members have been tougher to change than others. Mr. Wow’s parents fall into this category and no matter how many times we ask them not to buy us anything, they are determined that we must open a gift on Christmas morning. For them, we ask for a specific item that we want (and would be buying anyways). This year it’s a new GoPro since ours decided to kick the bucket while we were at Chautauqua. For the Mr and I, we are big on giving experiences, rather than tangible gifts. In the past, we have gifted each other amazing experiences like whitewater rafting, a hike to Potato Chip Rock, canyoneering down a waterfall, and a trip to New Orleans for a big football game. We much prefer spending money on experiences and memories, rather than an object or gadget that will just gather dust in a few months. Just repelling down a waterfall NBD! This year, I was able to get my family on board with this whole “no gift, let’s have an experience” attitude. As a family, we’ve decided to plan a vacation for early summer to get everyone together since we won’t be all together for the holidays. Now we just have to decide where to go, preferably a place that Southwest flies since we just got our companion pass. Any suggestions? Now I’d be lying if I said we weren’t buying any gifts this year. There is still one thing that we will be placing under the Christmas tree. It’s something that we do every year and honestly our families love them and look forward to getting them. Each year Mr. Wow and I make calendars for our families consisting of photos from throughout the whole year. I make one to give to my sister and her family, one for my parents and one for me to hang in my office. Mr. Wow does the same for his sister’s family, his parents and for him. It is one thing that I don’t mind spending money on. But in true frugal fashion, we would never pay full price. We wait for a sweet deal and then pounce on order them. I’ll patiently be waiting for the 50% off or more and BOGO. But Don’t the Kids Need A Gift? Between the two of us, we have 4 nieces, 2 on either side, all under the age of 6. And although they might disagree, toys are overrated. Instead we invest in their future, their college future that is. This year we’re taking it up a notch too. We’re also giving them their first taste of financial literacy. I can’t wait to see the look on their mom and dad’s faces when they pull out these beauties. Thanks FinCon for the sweet (and free) gift! I mean, they already know that we are kinda big money nerds. So there you have it, the official how the Waffles stole hack Christmas. Although we are still spending some money and getting some gifts, this year will be a fraction of years past and the money spent will be a good investment. Besides saving money, we have also done away with many other additional gift giving and receiving stressors. What do you think? What are ways that you combat the consumeristic ideals of the holidays? I’m with on the whole “buying experiences versus thing” for Christmas. One year we tried to get everyone to donate to a cause instead (usually something that reflects the receiver’s personality). For the nephews and nieces in the family, we’re doing exactly what you’re doing, putting money into the RESP (Canadian equivalent of 529s) where it will grow for future college expenses. And we’re definitely giving them that financial children’s book from FinCon. Go FinCon! It’s bizarre – I don’t buy anything for myself other than food it seems. I just recently purchased a desk, but I don’t need much. Completely agree with you: experiences over things! There was pretty much one thing that I wanted and asked for this year: a hydroflask food container so I can enjoy warm lunches during the winter. Seems silly, but seriously would add so much value to my life since I do not have the luxury of a microwave/ oven to heat up my lunches during the day. That’s it, just one item! But you’re right, I’d just buy it for myself if it wasn’t holiday time. Great minds think alike FireCracker! You know we’ll be reading that book non-stop whenever we are around our nieces. I’m determined to get them off on the right financial foot. I don’t really have to many gift obligations, which is nice. I sent gift cards to my nephews and I take part in a adopt a family thing every year, but I have a small family (and weird at that) so it’s pretty simple times for me. I think it’s great you are contributing to their college fund! The girls might not think it is that cool right now, but when they turn 18 and realize what we have done all these years, I bet they’ll appreciate it. Where do you do the adopt-a-family through? While the adults in the wishicouldsurf family have mostly successfully gotten each of our families to not buy gifts, it’s been tough for them to buy into our kiddo not needing to get gifts. Mine understands that we aren’t into the gifts and humored me with an extra short wish list with the #2 item – Peace on Earth – but she still asked for a couple of small things. I commend y’all for contributing to 529 plans for your nieces!!!! Also love that you are introducing them to financial literacy at a young age. Not sure why, but it definitely is harder to not give kids gifts. I usually love giving my nieces presents, but after years of seeing my gift tossed aside so they could continue to open up everything else they got, I finally realized that just contributing to their 529 plans was enough. I’ll leave the tangible gift giving to the grandparents. I’m easing my family into it. I didn’t want anything for my birthday and they were ok with that, but Christmas is a tougher nut to crack. I provided them a list of everything I didn’t buy myself this fall and told them to only get things on the list since I have a small place and nowhere to put things (like the knockoff GoPro I got last year). We have been doing that for years, but we still have one family member that does not like to get things off a list. They will buy a thing or 2 off the list and then get other stuff we didn’t ask for/want cause they think we will like it. Only time will tell, if this year we actually got through to them and are successful. I love this! I’m also of the mindset that gift-giving during Christmas is super overrated. It causes so much stress and heartache, and for what? Why not just keep the money and spend time with people you love? I’m still fighting this culture in my own family and have to play along with the present game. I’ll get them one day! It definitely takes time, for us this is 3-4ish years in the making. While some family members were quick to catch on, others still need more time. That sounds like an amazing time and one that your parents, as well as you and your sisters will love, especially with some IPAs involved!! Sounds like a new tradition has just evolved. Mr. SSC recently posted…Why You Should Never Settle. Some people are so ingrained with having to buy gifts and I think those people actually enjoy the act of shopping. For me its a no-brainer, I don’t like shopping and have really enjoyed not having to stress about what to buy people this year. I think my family is also enjoying that aspect of it too. Plus, we get to look forward to a vacation altogether next year. Keep working on your family, one day they might come around. I LOVE the way you “gift each other experiences”. It really is the experiences in life that matter. 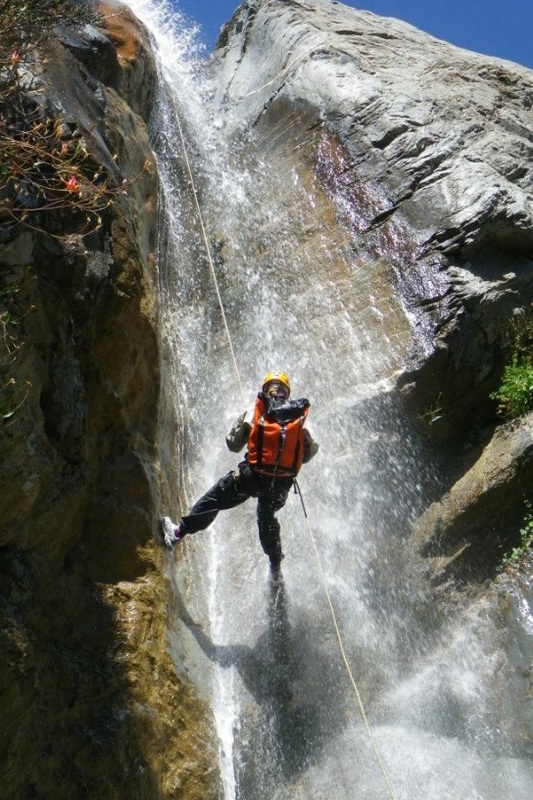 Rappelling down a waterfall? You two are SOOO cool. I must admit that I come up with the best ideas! The waterfall thing was all me ;o) and will be something that we remember forever. In 10 years no one is going to ask about the gadget we bought, but we will forever tell the stories of the experiences we had. As I said, you’re SOO cool! I’ve got a post coming out in two weeks on “Living Live At The Limits”. You’ll see in there that I’m doing a plea for comments on how my readers are living live at the limits, which I’ll publish in a “Part II”. If you don’t mind, I’d like to insert your waterfall shot, with a backlink to you, of course. Perfect example of what my post is about! Cool with you? Go for it (I made the pic a link to the actual file). There are some others from rafting and repelling if you are interested in getting a couple different ones to choose from. Just let me know. Awesome, thanks. I think I’ll take a screen pic to include the paragraph above, as well. Tells the story. I’ll let you know when “Part II” comes out, it’ll be after the New Year. Thanks! Love this post Mrs. Wow! Our family does many of these same things. One of our favorite ways to give gifts with family members is to give homemade gifts whenever possible. Sometimes this can be as simple as baking cookies, or it can mean weeks building a nice jewelry box. The gifts you make yourself feel like they have twice the caring as those you buy in the store! I love the handmade gifts, always means so much to me. My problem is that I always want to make something and then run out of time. This silly job thing totally gets in the way. Hey, Mrs. WoW. I love it. Mindful gift giving. Experiences over stuff. And beefing up the 529s for the nieces. Talk about doing Christmas right! I got a great CMLT reading this post. Thanks. You got it Mr.G! More meaning and less stress for everyone. Its definitely the way to do Christmas! Chipotle yum! Simple and enjoyable!! Love spending on experiences rather then things. I do really enjoy giving my family gifts on Christmas. I think its important remember that even though the personal finance community has one way of thinking so many of our family members may not think this way. Being grateful and just saying thank you for gifts you may receive from your parents most likely makes them feel great. I know I love it when someone really enjoys something I can bring to them. Happy holidays. I completely agree that many people don’t think the same way this FIRE community does and thats why it has taken some time to get our families on board with us, and still some family members feel the need to buy us gifts. I just feel that I’d rather receive something that I want or need and not just another purse or dish that gets thrown in the closet. We just don’t have the same appreciation for material items and thats ok. Thanks for stopping by DM!